Morgan Pine of Swanton with a basket Tuesday versus Wauseon. The Bulldogs fell to the Indians, 41-33. Ashlynn Waddell of Swanton, left, and teammate Kara Truckor, right, attempt to get the ball from Wauseon’s Marisa Seiler. 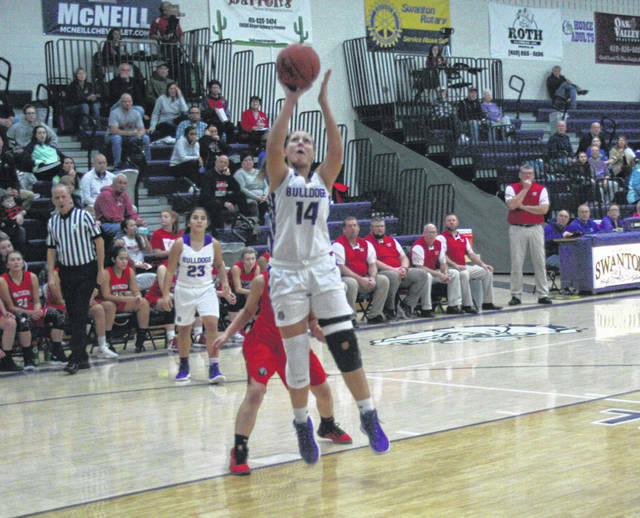 A game that early on seemed to be trending in favor of the hometown Swanton Bulldogs, changed near the end of the first quarter when the Wauseon Indians took charge with a stifling defense, leading to a 41-33 win in Northwest Ohio Athletic League girls basketball Tuesday. 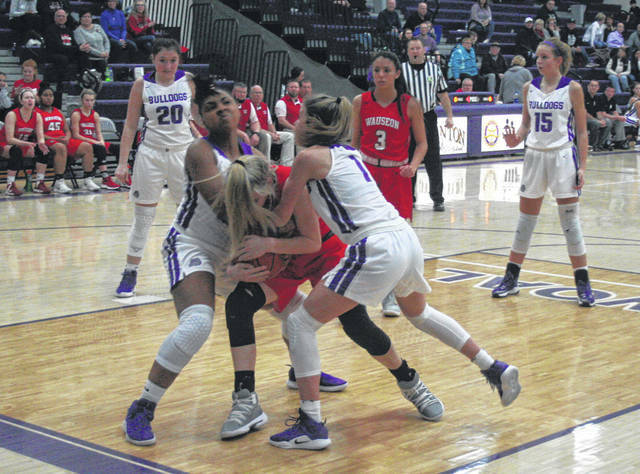 “I think we mixed it up enough,” said Wauseon coach Dan Seiler of his team’s defense that held Swanton to four points in the third period. “We played a little man. We played a little zone. We played a little trap. You know they got two really nice guards. They’ve got nice ballplayers. They are a nice team. Swanton mentor Eric Oakes, while very complementary of the Indians’ defense, felt his squad’s offensive execution was lacking. With the margin at 10-6 following Jessica Dohm’s bucket for the Bulldogs at the 1:44 mark of the first quarter, the Indians responded with a 10-2 run that stretched into quarter number two. Marisa Seiler stuck in a three-pointer for Wauseon, then Sam Aeschliman converted an Indian steal into two free throws, giving her squad a one-point lead at the quarter break. The Indians created many scoring chances off steals on this night, especially in the first half. Seiler scored on a drive to the hoop to begin the second stanza, then after Averie Lutz’ basket for Swanton, Aeschliman and Seiler each buried threes for a 19-12 lead nearly three minutes in. The Dogs would go on a run of their own before halftime. They answered with seven straight points, including a Dohm triple to knot the score at 19 with 1:34 to go. A Sydney Zirkle putback off her own miss put Wauseon in front at the half. Swanton also caught a bit of bad luck in the closing minutes of the half. Senior leader Bridget Harlett suffered an injury to her right leg, having to be helped off the court without being able to put weight on the leg. The timing of the injury puts the rest the season in doubt for Harlett. Zirkle outscored the Dogs herself in the third period with eight points. A Dohm basket inside cut it to 29-23 after three, but Swanton got no closer in the fourth. Wauseon made 10 of 14 free throws in the final period to close it out. For Swanton, it can be argued that the loss of Harlett had an effect. Not only were they absent one of their better players, but also a vocal leader. Swanton went to Cardinal Stritch Monday where they picked up a 39-16 victory. They are at Liberty Center Thursday before hosting Otsego on Saturday.